Diana Ptaszynski of Suburban Girl Studio is hosting a waxed linen blog hop today. If you are not a jewelry designer, you may wonder what waxed linen is. It is a linen thread that is coated with wax for stiffness and durability. As far as I know, it was originally used for artisan bookbinding and for twining handmade baskets. It comes in many colors and is a fun and versatile material for stringing beads. Spools of colorful waxed linen. A couple of years ago I took a class from Erin Siegel where we learned to make earrings using Irish waxed linen. I’ve been happily knotting linen cording ever since! Diana and I learning to use waxed linen, with Erin’s guidance. When I first heard that Diana was hosting a waxed linen blog hop, I imagined that I would have quite a few pieces of new jewelry to show today. But I’ve been so wrapped up in making ceramic pendants lately, that it wasn’t until last night that I started to work on a necklace. However, I do love working with with waxed linen, so making this necklace was a pleasure. The ceramic raven pendant was made by Oh! Sullivan Studio. Most of the ceramic beads were made by Mary Hubbard of White Clover Kiln. The dark blue ceramic beads are from Kazuri Beads. There’s some recycled glass and Czech glass beads, too. I like the way that the linen knots separate the beads, so they stand out more and the way it adds an extra bit of color. I am looking forward to visiting all the other participants in this blog hop. Their creations will be so inspiring. I’d encourage you to visit their blogs too. The links are below. 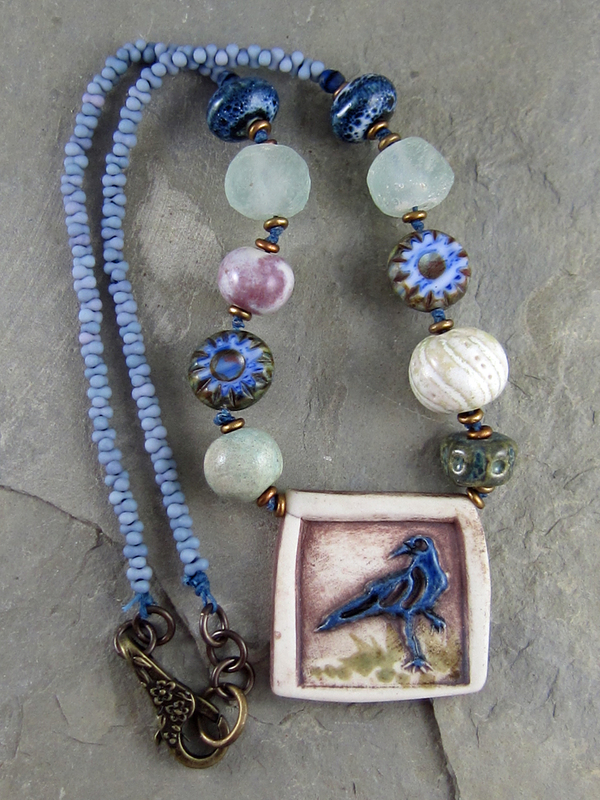 This entry was posted in Art Beads and Components, Bead And Jewelry Challenges and tagged Art Beads, Art jewelry, blog hop, Diana Ptaszynski, Erin Siegel, jewelry, Linda Landig, necklace, Suburban Girl Studio, waxed linen by Linda Landig. Bookmark the permalink. Very pretty Linda – love how you’ve picked out the colours in the pendant. Beautiful necklace! It’s going to be fun to see all the ways people have used linen in the hop. I love that pendant. Hi Linda, Your necklace is wonderful. You chose colors very well to accent the focal perfectly and it has good texture. Lovely elements you’ve brought together here! I don’t envy you stringing all those peanuts onto the cord though….patience! You may have only made one piece, but you made it a good one! My husband happened to glance up from his book as I was on your page and actually stopped reading to comment on how cool he thought your necklace is… it was probably the raven that caught his attention. A really nice mix of beads and colors. Love it! And this is the wonderful thing about waxed linen. You can whip up something quickly with it. I love what you made!!! Thank you for participating! I love the blue knots in between your main beads, it’s such a pretty touch. Linda, I loved reading that your journey with waxed linen started with my mini-class at Bead Fest. That makes my heart so happy that the experience inspired your jewelry-making. I love that photo of you and Diana working away during class! What a perfect photo to share. I love it! I’ve seen you do some really lovely work with waxed linen cord since that day. I’m so happy to hear you are enjoying it and the waxed linen has become a favorite material for you. Keep up the awesome work! Thank you Erin. Just think of all the people you have inspired through your book, tutorials and classes! You rock, lady! Such a pretty necklace! I love the focal bead and the way you picked up its colors in the accent beads and the way the knotted cord helps those beads stand out, too. Love the necklace you made—beautiful composition and colors. I’m going to have to pull out my waxed linen and experiment! Beautiful Linda! I could’ve picked this as yours just from the photo. What a nice comment! Thank you Janet! Gorgeous! I love the way all of your elements just flow together so perfectly. Who needs quantity when the quality of your piece is so beautiful! What a gorgeous necklace! I love the different blues and that raven focal is to die for. Wonderful necklace! I love the subtle, but deep colors and the raven pendant works perfect! Beautiful necklace! What patience you have to string all those “peanuts” – wow! What a nice piece. The colors, the beads and the focal all flow to create one beautiful necklace. Linda-What a lovely necklace! I love the colors. Beautiful necklace. I like the focal is very pretty and a good way to use the waxed linen! Wow, I can’t imagine putting all those little ‘peanut’ beads together on some linen. Love the color and design in your necklace. Very fun. I, too, like the pop of color with the linen knots in between the beads. Very pretty. I love everything about your necklace, fantastic!! Loved the necklace. The bead variety was great and the focal is killer ! Really pretty necklace Linda, love the combination of bigger beads and peanut beads, and the soft texture of the linen against the ceramics. I love your necklace it is beautiful. 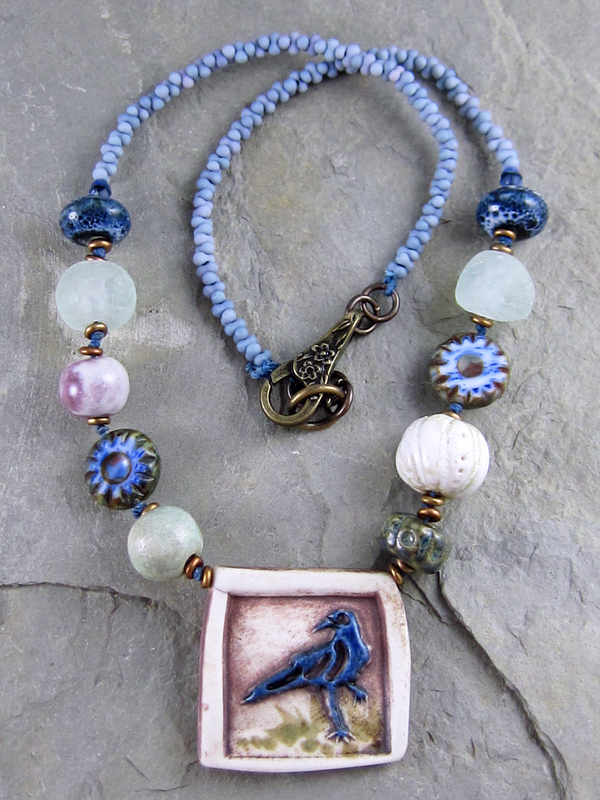 the blue and cream colors just really make the raven pendant pop. I love your necklace, Linda, and I love the color of cord you used! It really does show off the beads! I like your clasp too, I’ll have to find some of those! Lovely necklace! thanks for sharing it with us!! Beautiful necklace. What a great mix of art beads you used. So that raven would have totally stumped me…its square (square things stump me) and its a raven! But it looks so cool and peaceful and happy in your necklace…like it was made to be in that exact spot. Love the colors and the peaceful feeling this necklace evokes. Thank you Kashmira. 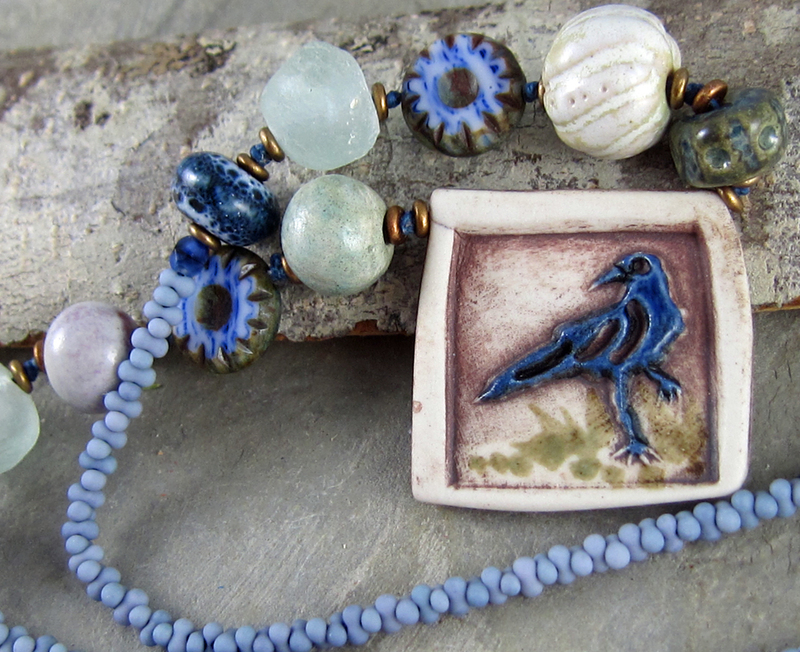 I like the idea that the raven looks happy and at home in this necklace.. Such a nice comment! Beautiful necklace the colors are perfectly paired and I love that focal. You know I love everything you do and this is no exception!